Let’s wait and see how a variety of factors shape the real estate market as we finish 2017 and move into 2018. Today we will discuss a few of them. We are now in the 8th year of the so-called “economic recovery” and the 10-year treasury rate remains below 3%. Although the real estate industry loves low rates, this is troubling. The bond market predicts economic conditions before anyone else, so it is basically communicating to us that it doesn’t believe the economy is so hot. Take a look at the chart below and you will see a brief spike after the 2016 election, but the rally in rates has faded. 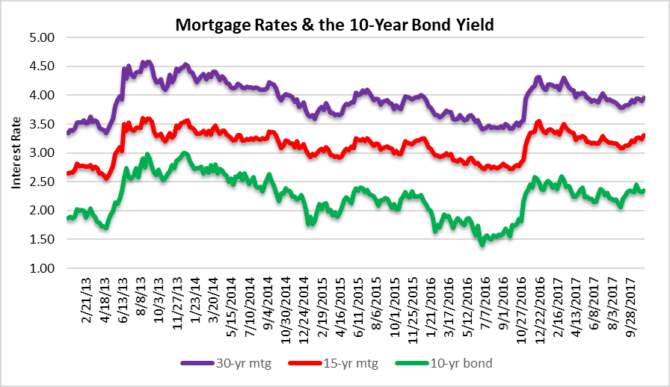 Until the 10-year gets over 3%, the real estate market will continue to receive support. After that, as mortgage rates get closer to 5% you will see a significant slowdown in transaction volume and downward pressure on real estate prices. Until then, party on! Some of the proposed changes to tax policy could impact real estate bigly. Capping the mortgage interest deduction, eliminating state and local tax deductions and eliminating the tax deduction on second homes could have far-reaching impact. There are notable differences in the Senate and House bills and we found a good chart on CNBC that compares the two. Until the legislation goes through reconciliation, we won’t really know the impact on property markets. What’s great is you can just hover over each line item to see how the Senate and House proposals differ. 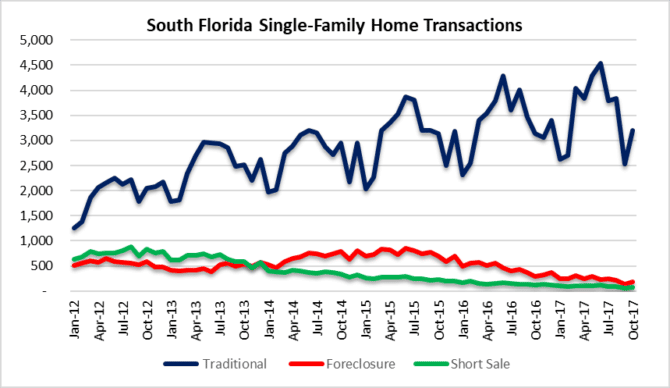 After Hurricane Irma stalled sales dring the month of September, we figured that transaction volume would rebound in October. Not so much! After a 34% decline from August to September, sales of single-family homes only snapped-back 26% off the low. As for condo transactions, they only had a small rebound as well. After declining 24% from August to September, they bounced back only 14%. As we always say, one month does not make a trend, but transaction volume will be worth watching as we finish 2017. 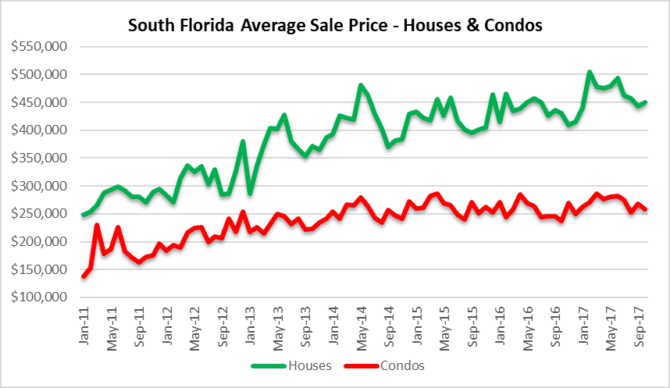 From the look of the average sale prices of houses and condos in South Florida, it sure looks like the price momentum has stalled. It’s never a good idea to try and catch a falling knife. With all the uncertainty in the real estate market, it may be worth sitting on the sidelines for awhile. In October, the average sale price of a single-family home in South Florida was $449,577, up slightly (2%) from the September drop. This is still an 11% decline from the recent peak of $505,236 set in February of this year. The average sale price of a condo in South Florida declined 4% to $257,703. 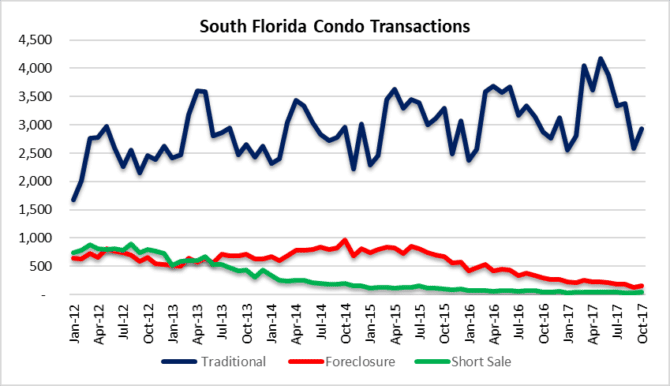 If you take a good look at the chart, the average sale price of a condo in South Florida has remained somewhat stagnant for the past few years. What will happen once the onslaught of new construction product hits he market? This entry was posted in Mortgage rates, South Florida Real Estate and tagged Florida REO, housing bubble, Miami condo market, mortgage rates, South Florida real estate. Bookmark the permalink. Trackbacks are closed, but you can post a comment.